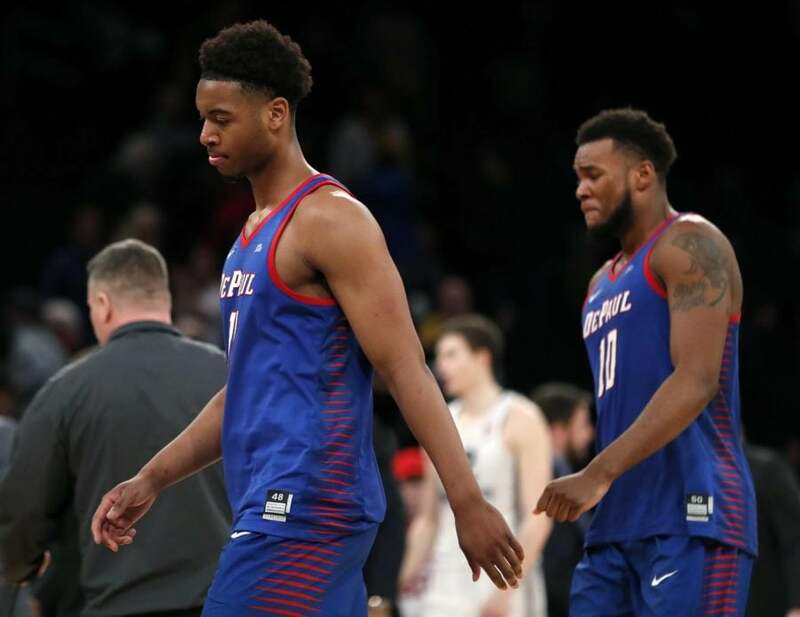 NEW YORK — It was a movie DePaul fans had seen many times this season; an up and down journey to a single possession gone awry in the final seconds — so predictable it’s almost comical. But falling short in a must-win game at Madison Square Garden against a team you beat just two weeks before is hard to watch. 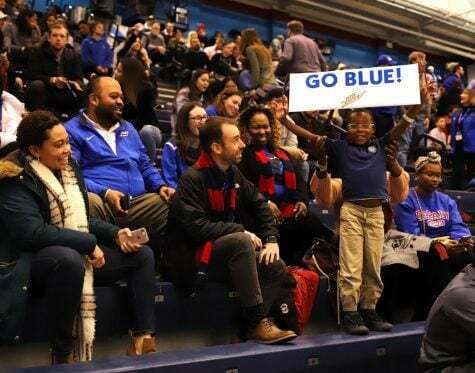 Even for the most cynical and fed-up Blue Demon fans. And so DePaul’s debut season at Wintrust Arena officially came to a close Wednesday night, dropping their first ever Big East Tournament matchup with the seventh-seeded Marquette Golden Eagles (19-12, 9-9 Big East) 72-69 in a slushy Midtown Manhattan. 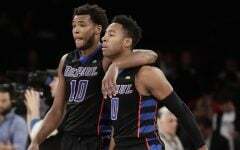 The Garden seemed to be getting to the Blue Demons (11-20, 4-14 Big East) early on. 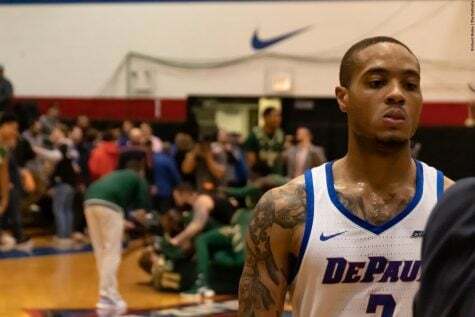 Looking uncomfortable and unsettled as a unit, Brandon Cyrus scored DePaul’s only two points in the first five minutes. At the 15:40 mark, Eli Cain drove to the basket for what could have been a vicious, momentum shifting dunk, but it rattled off the side of the rim. After DePaul spent a solid five minutes of failing to locate the basket, center Marin Maric found his groove. The Croatian big man broke the Blue Demon scoring drought with a lay-up, followed immediately by a steal from Max Strus. Cyrus took the ball down the court, dropped it off to Cain in the key, who then flipped it up to Maric for the lay-in and the foul. He knocked down his free throw to tie the game at seven. 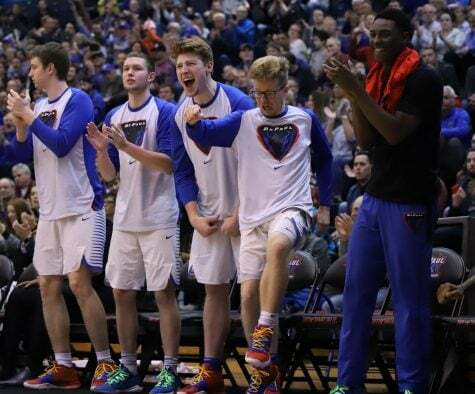 Just 30 seconds later, Cain kicked the ball over to the 6-foot-11-inch Maric at the top of the key to launch the go-ahead three-pointer to hand the Blue Demons what would be their only lead of the game. But of course, in an all-to-familiar fashion, the wheels started to fall off the bus just as they started to turn. 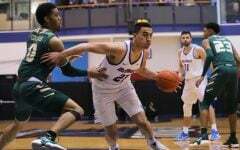 After Maric’s three, the Golden Eagles ripped off a 16-2 run to storm back into a lead they would not relinquish. 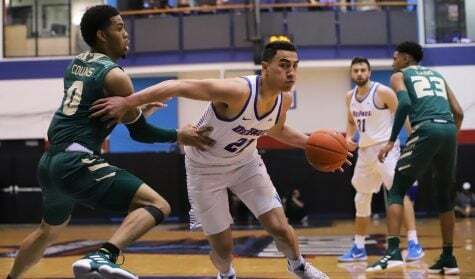 Up until this point in the game, Strus — DePaul’s leading scorer at 16.6 points per game — was yet to score a single basket. 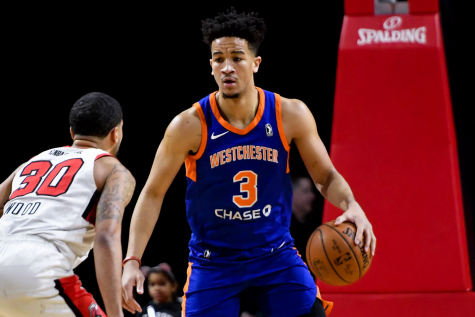 Strus would finally drill a three-pointer with under five minutes to play in the half, pulling the deficit back within single digits. 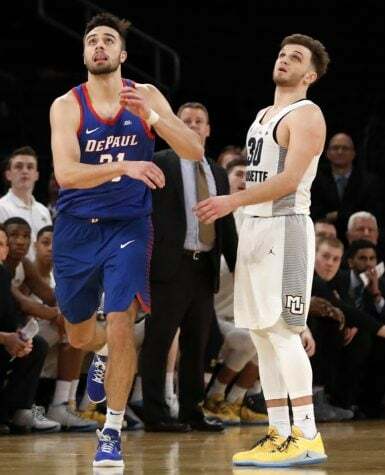 Marquette’s Andrew Rowsey — who turned in a game-high 25 points on 8-of-20 shooting — hit a floater at first half buzzer to send DePaul into the second half with 12 point deficit. 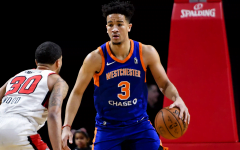 After a slow start in the first half, Strus came out swinging to open the final 20 minutes. 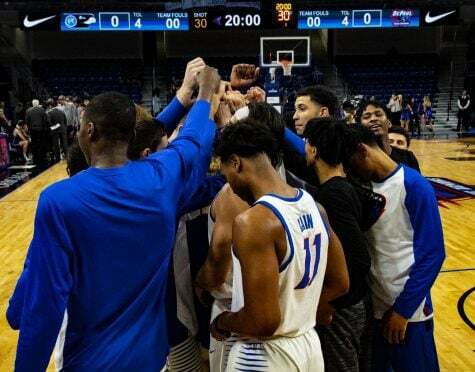 Breaking toward the basket and launching himself into the air to catch and slam home a lob from Eli Cain, it took Strus eight seconds to set the tone for the Blue Demons in the second half. The junior, Division II transfer followed up an underwhelming three points (on 1-of-5 shooting) in the first half with 19 (on 6-of-12 shooting) on in the second half to tie Marin Maric (7-of-12 shooting) as the team’s leading scorer with total of 22. Maric also corralled 10 rebounds. Cain finished his night with a double-double, dropping 12 points on 4-of-12 shooting to go along with 10 assists. Thanks largely to an explosive second half from Strus, the Blue Demons we able to keep the score close in the final 10 minutes. 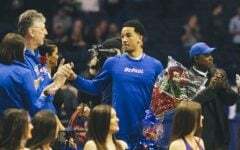 DePaul did an exceptional job getting to the charity stripe, often on three-point-play attempts, giving the Blue Demon’s a handful of easy points to keep the deficit in check. 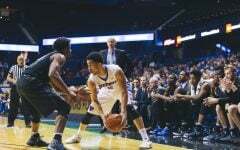 With little more than a minute to play, the ball was called out-of-bounds off DePaul, giving possession to Marquette. 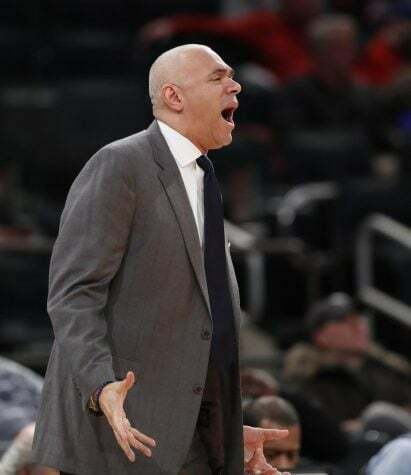 Video replay changed the ruling, giving DePaul an extra possession — the kind of break that can turn a close loss into a win. So, what did they do? 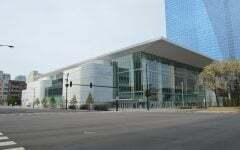 They threw it carelessly across the baseline and out of play — Marquette ball. With 21 seconds to play, Strus took the ball at the wing with a chance to make it a one-possession game. Blanketed by defenders, he hucked up an off-balance, line-drive right into the heart of the basket. The score now 70-69 with 19 seconds remaining, DePaul needed a clean turnover. Cyrus delivered with 11.5 seconds remaining, wrestling the ball away from a scrappy Rowsey. 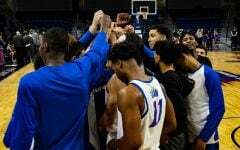 The Blue Demons had earned one last possession. 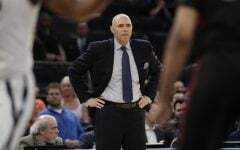 Leitao called his play and it all seemed to work; Strus was standing all alone, ball in hand, staring down a shot he’s made hundreds, if not thousands, of times. Strus put it on a perfect line, but didn’t give it enough gas. 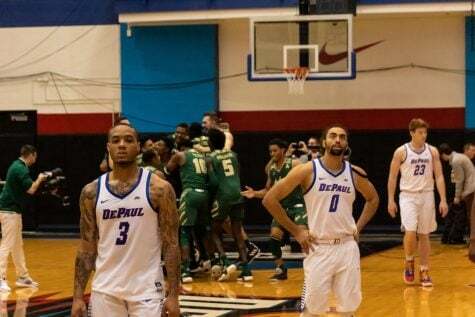 DePaul fouled Rowsey in a last ditch effort to force an overtime period, but with 0.4 seconds to play, Strus’ final, three-quarter-court shot fell just short and wide left. 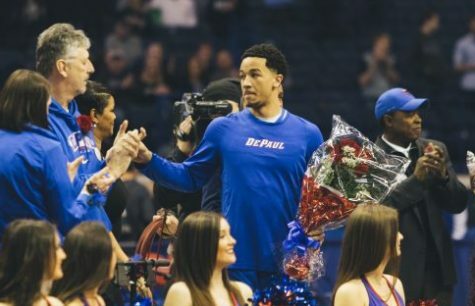 Yes, this was perhaps the most talented team DePaul has put on the court in years, but make no mistake about it in that this was a painful season to watch, especially after Devin Gage hurt himself and Eli Cain was forced to run the point guard position. I really do like the young core of Roberts, Butz and Reed going forward but they need help from some good recruiting classes. Really need to find some junior college talent for the front line. 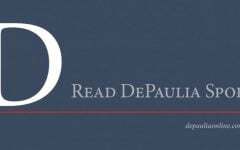 DePaul needs to get rid of that broad of an Athletic Director.